MY prayer for the New Year 5773 is simple. Peace of mind for individuals. Shalom in all senses of the word. MAY Hashem bless my entire family and the community for a happy and healthy New Year. As always, I express my thanks and humbleness for all the blessings You give us each and every day and we pray for peace and prosperity for all. AS we start the New Year I hope and pray that Hashem will watch over all of mankind. We hear and experience so many troubling events in the world and we have become numb to all the death and destruction in the world. We think nothing of how mankind can be so cruel to each other. We need to work harder and help those who need our help. We need to work aggressively on helping America get back to being the worlds leader and economic powerhouse that we have always been. I hope and pray that Israel will be a bright light for the world and that the world leaders understand that Israels fight against terrorism is a fight for all of us. I hope that 5773 will be the year that mankind learns to live in peace. THE year 5772 has been an eventful year in my life. My extra special wife Gen, whom I cherish deeply, and I just celebrated our 60th wedding anniversary. It seems like yesterday we began our lives together. Four gifted children. Barbara, Lisa, Marti and David and nine grandchildren and now a great-grandchild and my sister Devera have given us so much elation. My law career has come to an end. I hope in some way I made society better. 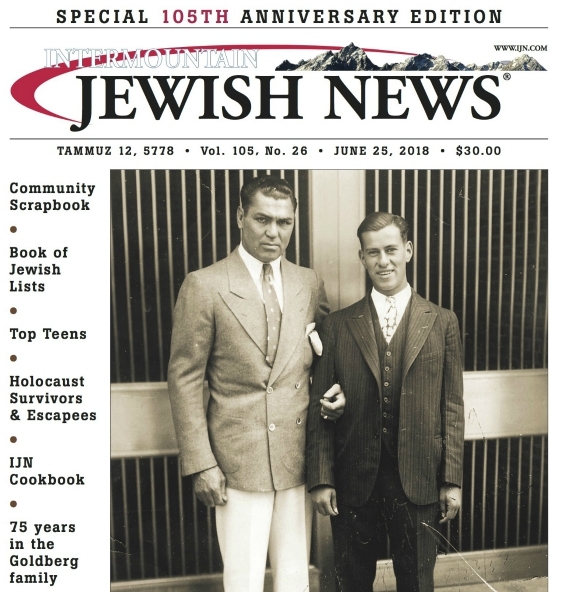 I especially want to thank the Intermountain Jewish News  Miriam, Hillel, Larry, Andrea, Chris, Seiji, Jeff and Carol  for the role they and all other members of this renowned publication have played in my life. In closing, I wish all a happy New Year. FOR the coming year . . . I would like to extend my sincerest wishes to all for peace and prosperity. May you be blessed with tranquility, rejuvenation and strength! May the leaders of our communities be blessed with reason, clarity and inspiration to lead us in unity! As we approach Rosh Hashanah, the breakfast of the upcoming year, we are given the opportunity, once again, to hope. We hope that our community will heal from the bad supper we experienced this summer in the form of both natural and human-caused disasters and tragedies. But each of us also hopes for ourselves that this coming year will be filled with personal joy and celebration. May we each have a hopeful and optimistic New Year! WHENEVER people tell me they are going to Jerusalem, I write a prayer for them to take to the Western Wall. Over the years, I have no doubt that many scraps of paper have been misplaced, forgotten or scattered unseen in a gust of wind. My prayer never changes. But life changes me. Faces disappear. The list grows shorter. In the end, its not about me, or you, or even G-d.
Its about us. Le-Shana Tova. MAY you always have  Enough happiness to keep you sweet; enough trials to keep you strong; enough hope to keep you happy; enough failure to keep you humble; enough success to keep you eager; enough friends to give you comfort; enough wealth to meet your needs; enough enthusiasm to look forward; enough faith to banish depression, enough determination to make each day better than yesterday  For today and always. THE special foods, the simanim or signs, that we traditionally eat on the first night of Rosh Hashanah includes a prayer. Taking a taste of dates, we say, may our enemies meet their end. This year, the object of that prayer is the current leadership in Iran. Israel is in existential danger. Lest anyone think that leaders will not sacrifice millions of people for irrational ends, consult the leaders of the Ottoman Empire during the Armenian genocide, or of Nazi Germany during the Holocaust. This year: May the weapons of Israels enemies  including the ideas behind them  meet their end. THIS Rosh Hashanah, I am full of gratitude for my children, grandchildren and great-grandchildren. IN six days Hashem created the heavens, earth, and its inhabitants. According to the sages, creation commenced on the 25th day of Elul, and six days later Adam and Eve (Chava), the first man and woman, were created. Rosh Hashanah commemorates the creation of Adam and Chava, the ancestors of humanity. Accordingly, this singular anniversary was designated to serve as the perennial day of judgment for their descendants. A distinguishing feature in the creation of man is that, unlike all other species, which were created in large numbers, Adam was created single. This indicates that one single individual has the capacity to bring the whole of creation to fulfillment. Every Jew has the capacity to rise and attain the highest degree of fulfillment and to elevate the entire creation. The message of Rosh Hashanah is is that each and every one of us has the tremendous potential to improve and elevate himself, his family, society and even the entire world. Lets begin with a mitzvah. Lets do it with joy. And together, lets bring Moshiach. Today. May Hashem bless us with a year of health, meaning, success and inner joy. May we recognize and appreciate G-ds blessings. And may we experience true peace in Israel, and indeed, the entire world. Why did Israel choose Bibi again? Suzanne Patt Benvenisti of the Taub Center for Social Policy Studies in Israel on the pressing social and economic issues in Israel today. At Beit Tikva. Special pizza night at Moishe House, with all the toppings for matzah pizza. Six-session grief support group for those suffering any form of loss. Facilitated by therapist Rabbi Jay Sherwood and Lisa Sherwood. At Temple Shalom in Colorado Springs. Special Passover event for women, using the Women’s Haggadah. Hosted by the Sisterhood. Weekly conversational Hebrew class taught by experienced teacher Roberta Feinsmith. Meeting Wednesdays at BMH-BJ.